Episode 113: What is an Inbound Strategy? Strategies are high-level plans for achieving specific objectives. Strategies guide your efforts, and inbound strategies are no different from any other strategy in this regard. Where an inbound strategy differs from other strategies is that inbound strategies are more than just a guide, they are a mindset and an attitude, and they touch every level of an organization. 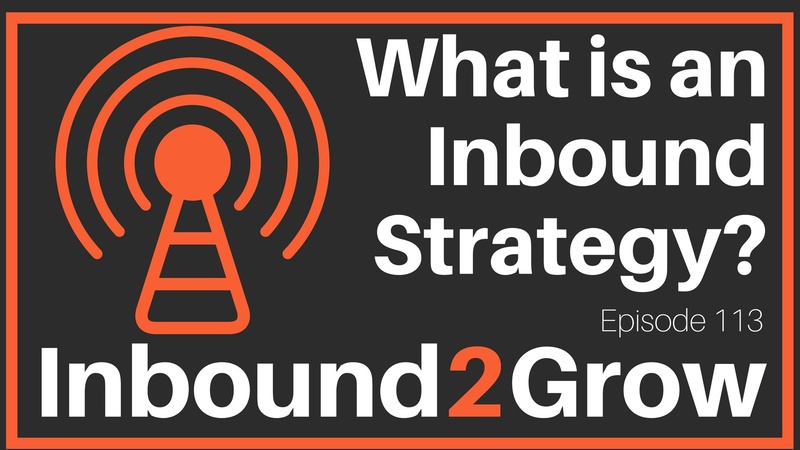 [0:42] Question: What is an Inbound Strategy and How is it Different from Any Other Strategy? Where do they want to be helped? What form does that help take? How is everyone in the organization contributing to providing that help? You begin to arrive at an inbound strategy by answering these questions. Tactics are the tools you use to help your customer how they want to be helped and where they want to be helped. Inbound strategy is how you execute your mission and details how you will delight and help your customers across all levels of the organization and throughout the entirety of the buyer journey. You want strategies that blow your customers away. Selling is helping. You need a coordinated strategy so you know how your buyers are moving through the buyer journey. The opportunity to grow and succeed will come more and more from creating amazing customer experiences rather than innovating products or features. People increasingly expect that products will be performant, differentiation is created through inbound strategy.